I can openly admit I struggle, at times, with experimental literature, understanding how it works, what a given experimental text means, the significance of the text. I’ve been reading Christopher Higg’s series with great interest in the hopes that his thoughts might help address some of the intense confusion I feel. His posts have indeed helped but I’m still struggling. 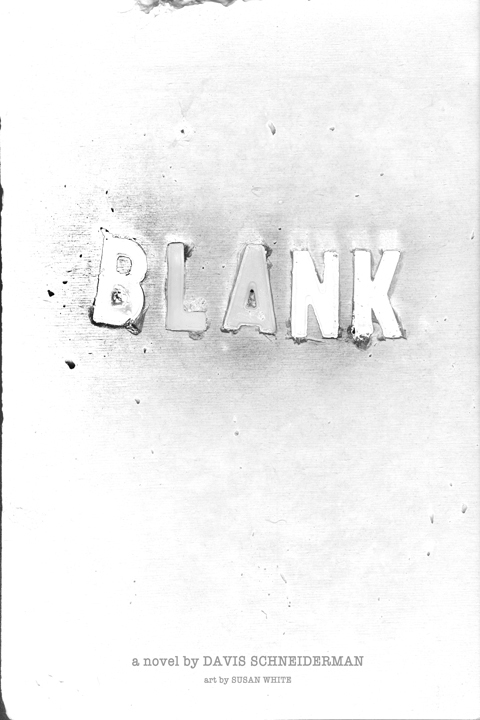 At AWP, I had the opportunity to pick up the book Blank, a novel by Davis Schneiderman, published by Jaded Ibis Press. I had received some press materials about the book in the preceding months so the title was familiar and I had also recently met the author so I thought I would buy the book and see what it was about. I didn’t pay close attention to the press materials so nothing could have surprised me more than to realize that Blank is actually blank. I probably should have but that’s a different matter. There is no text in the book save for the copyright page, the Table of Contents, twenty chapter titles, an About the Author page and an About the Artist page. There is also artwork, by Susan White, what appear to be pieces of pictures of water, clouds, snow—it’s difficult to make out what some of the imagery represents. That night in my hotel room, I opened the book and realized it was blank and felt angry about the $15 or so I paid for the book. I ranted something incoherently at my roommate then angrily shoved the book into my suitcase. I may have used the word, “Seriously,” with a tone. I served on a panel at AWP ’11 about Hint Fiction and during the Q & A session, a young man asked about whether or not a writer could tell a story without words using a character or symbol, for example. Michael Martone, one of my co-panelists, said absolutely and gave some useful examples and I said something about stories that incorporate symbols as part of the narrative because that was the best example I could come up with. I had not yet purchased Blank. As I have “read” this book I’ve thought about that young man’s question and whether or not I was actually reading a story. In the ensuing weeks, I have struggled to understand the why of this book. Why publish a blank book? And if you’re going to go with the blank concept, why include the About the Author page? That seems to directly contradict what I perceive as the ambition of the project. If the text is blank, should not any information about the creators of the text also be blank? In his first post, Christopher wrote that there is no such thing as an experimental text but rather there are texts that tend toward experimentation. I get that and if such is the case, this is a text that tends toward experimentation a great deal. The publication of a blank book has a performative feel to it I appreciate and there’s definitely an element of play at play but then what? The experiment feels finite which brings me to the idea of open and closed texts. In that first post Christopher also discussed closed and open texts and how closed texts tend toward the conventional while open texts tend toward the experimental. As I’ve tried to apply that thinking to Blank, I’ve thought this book might be both a closed and open text and in that case, what does that make the text? The text feels rather closed in that we are directed to a certain reading; we are directed, in fact, to having nothing, save for the chapter titles, to read. At the same time, there is a vast openness to the text. There’s room for all kinds of interpretation about the text (or absence of a text), the author’s motives, etc. In the second essay on the question of experimental literature, Christopher wrote, “What I am proposing is that one way to think about experimental literature is to conceive of it as that which experiments on/with Aristotelian prescription.” In thinking through Blank, there’s nearly no trace of anything remotely Aristotelian. There are none of those hallmarks of convention save for the chapter titles. The inclusion of these chapter titles might, indeed, be the clearest manner in which Blank does experiment with Aristotelian prescription. The chapter titles seem to deliberately taunt the typical narrative arcs we see in fiction with titles like, “Chapter 1: A character,” and “Chapter 2: Another character,” and “Chapter 3: They meet,” and “Chapter 8: They fall apart,” and “Chapter 14: They reunite.” The titles are smart, witty and I chuckle every time I read the Table of Contents. I think about the commentary the titles might be making on modern fiction, about how many stories actually do follow the outline implied by the contents and how given how standard that outline is, it might not really matter what’s on the actual pages of the book because so much fiction is simply telling the same old story. That’s just my interpretation though. I could be way off base. Is this interpretation what the author intended? Does it matter what the author intended? Is the creator of a blank book an author? I have no idea what to make of the artwork. I cannot begin to make sense it, torn pieces of pictures (that’s how I see them anyway), placed throughout the text at intervals from which I find no discernible pattern. As I try to make sense of a blank book, I have lots and lots of questions like the ones above but also, what is a book? How does someone review a blank book? What is the value of this kind of experiment? How many people are using the blank pages to write their own story? Or grocery lists? Or a phone number? I suppose this must be the point of experimental work, or work that tends toward experimentation—the kinds of questions the work inspires about writing and how we interpret writing.